It is a requirement to get married for anyone now. Filipino. American. Nigerian. they all must get a CENOMAR to marry in most municipals now. It is requirement to get married for anyone now. Filipino. American. Nigerian. they all must get a CENOMAR to marry in most municipals now. I thought they went to US Embassy and to a legal capacity to marry in lieu of the Cenomar if a US Citizen. I thought they went to USEM and to a legal capacity to marry in lieu of the Cenomar if a US Citizen. No. They get affidavit in lieu of legal capacity to marry, AND, a CENOMAR from PSA. This is exactly what is bad about all the sites offering free help, so much bad info, it is difficult to figure out what is good and what is bad. Don't get all riled up, Let me do some research. I have only done K1 visa, never been married in Philippines. Simmer down, I had a friend recently got married in Philippines, I will holler at him today and find out what he did. Remember this is called a forum and it is for discussion of topics. At one time I looked into marriage in PI. I was under the impression that a US Citizen only can't get a Cenomar from the NSO which is now PSA. I am always willing to learn, I am doing my research at the moment as well, just doing it first hand just in case I decide to get married in the Philippine. I got married in the Philippines in 2013. They would issue a Form No. 4 (CENOMAR) to show there was no record of marriage in the Philippines. They would issue a Form No. 5 - Advisory of Marriages if there was a record of previous marriage(s) in the Philippines. At the time of application for a CENOMAR, we didn't know there were two different forms. I assume PSA figured which one they actually sent us, based on the information we provided when we applied and once they checked the records. My wife received a Form No. 5 - Advisory of Marriages and I received a Form No. 4 (CENOMAR). 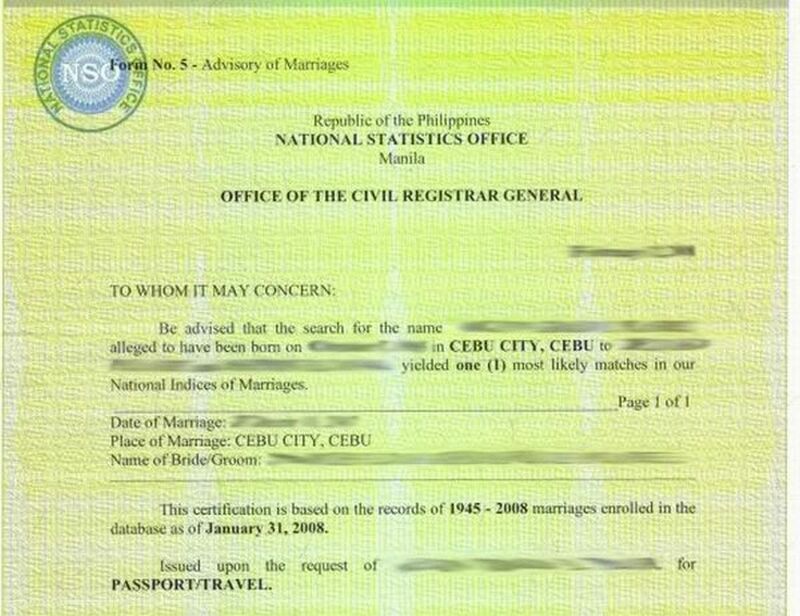 These forms were not only required to get a marriage license in Cebu City, but could prove very informative. Previously, my wife had sent in for all her document and during this time realized that her 1st husband was already married to someone else when they got married. Needless to say, it was a lot easier to take care of than having to get an annulment. Technically, her marriage to him was never valid. All she needed to do, was to provide documents from the PSA to the court. The court then declared her 1st marriage Null and Void. That was the old rules but rules but rules change. I don't think I had to get a CENOMAR 11 years ago but shortly after that some municipalities started requiring them and now I imagine they all do. It's not like they locate your birth record and then follow through your life to see if you've ever been married. They just do a database search on your name/birth info and see if they get a hit. Nine years ago, I was required to get a CENOMAR for myself and my wife-to-be before we got married. As far as I know, that is still the requirement. Indeed, they DO issue CENOMAR's to foreigners. All the CENOMAR does is state that you are not currently married in the Philippines. The affidavit you get from the consulate or embassy just says you aren't married in the US (by affidavit). I swear I'm not married in the US. How do we know you're telling the truth? I paid $50 for this piece of paper. It was around 2007 when I was looking into getting married, From doing research now of days they do require a Cenomar from a US Citizen. Without fees like that, I doubt the Consular Office would still be in Cebu. 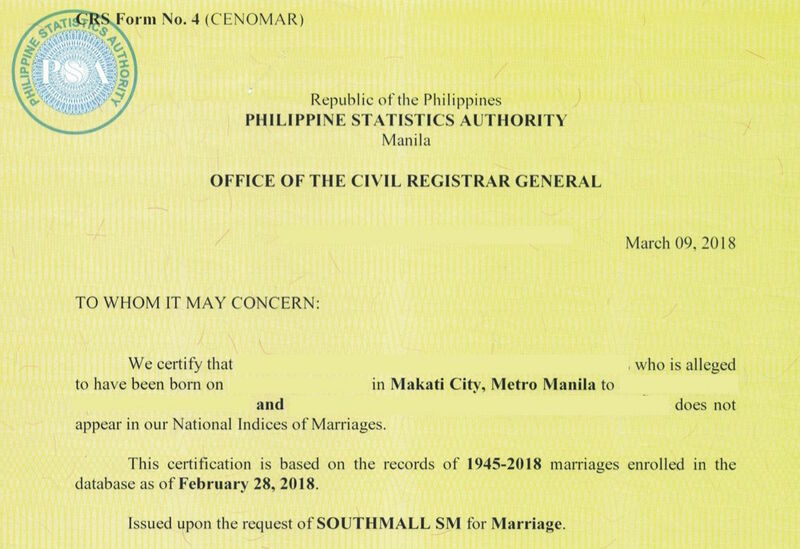 The﻿ “Affidavit In Lieu of a Certificate of Legal Capaci﻿ty to Contract Marriage” paper from the embassy or consulate that you refer to is only for those wanting to marry in the Philippines. It is no﻿t needed for those planning to marry in the US﻿. Your fiance may require a CENOMAR from the Phili﻿ppine government, and you will need a copy﻿ of your divorce decree, but that is ﻿﻿all﻿. 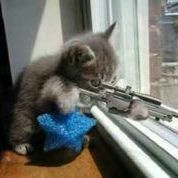 Headshot is on target. But You do not need a copy of your divorce decree, the consulate in Cebu or Emb in Manilla provide the document as stated. I just accomplished this in December. Blam married. however... I am in Leyte and as we all know sometimes there are different interpretations of the rules depending on your location. As to the Ops questions, listen to Shadow.